Last night Politico reported that Supreme Court nominee Neil Gorsuch had plagiarized portions of his book in “nearly verbatim” fashion without citing the original sources. The ramifications of this for his ongoing confirmation process are still playing out. But it turns out Gorsuch is at least the fourth member of Donald Trump’s political team who has been caught plagiarizing things. 1. Melania Trump: Donald Trump’s wife plagiarized entire passages of her Republican National Convention speech from a previous speech given by Michelle Obama. When Melania got caught, the Trump campaign blamed it on Meredith McIver – a person whom no one outside the Trump team has ever met or spoken with or managed to photograph (source: CNN). Donald Trump has previously blamed that same “Meredith McIver” for false claims he had made in his own book (source: Washington Post). 2. Monica Crowley: Donald Trump’s pick for a National Security Council deputy role was forced to withdraw after it was revealed that she plagiarized portions of her Ph. D. dissertation and portions of her 2012 her book (source: Politico). 3. Betsy DeVos: During her confirmation process, it was revealed that Donald Trump’s Secretary of Education nominee had plagiarized a member of the Obama administration on her Senate questionnaire (source: CNN). Senate Republicans confirmed her anyway. 4. 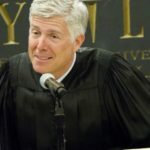 Neil Gorsuch: What happens a Supreme Court nominee, who by definition is supposed to be a bastion of perfect personal and legal integrity, gets caught plagiarizing in a book he’s selling on Amazon? We’re about to find out (source: Politico).